Reporting on the findings from a study of young people across 11 different world locations (Australia, Mainland China, Greece, India, Indonesia, Italy, Korea, The Philippines, Poland, Spainand Taiwan), A Global Perspective of Young Adolescents’ Peer Aggression and Wellbeing looks beyond bullying to assess the harm to mental health and wellbeing of young people experiencing peer aggression in all its forms. The first book in a global movement that recommends a new dialogue on peer aggression, this book delves into the poorly understood nexus of peer aggression and bullying through the use of statistical data from questionnaires, as well as the students’ own words and illustrations. By considering data from multiple countries, it addresses critical questions about cultural variation in aggression and associated wellbeing. 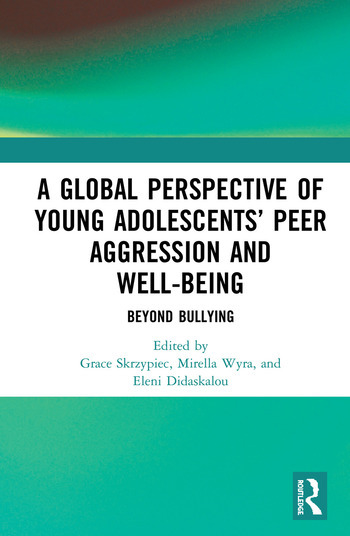 Addressing the issue that there is a growing focus on other forms of aggression other than bullying, A Global Perspective of Young Adolescents’ Peer Aggression and Wellbeing will offer invaluable insight for practicing teachers and school counselors, as well as any researchers with an interest in the health and wellbeing of young adolescents. Dr. Grace Skrzypiec is Senior Lecturer in Education at Flinders University, Australia. Dr. Mirella Wyra Senior Lecturer in Education at Flinders University, Australia. Professor Eleni Didaskalou is Adjunct Associate Professor at Flinders University, Australia.